On a Northerly, Westbury i consider is the best soaring ridge in Wiltshire... if not the Universe (within a 30 mile radius of my house) So was no surprise to find a whole load of freaks and strange types prepared to spend 4 hours on a cold hill in Feb.
Lots of maidens too.. Marks 'New Sting' flew beautifully and joins the 'Big Sting' and 'Sting' of models he has owned. Not a creature of habit Mark. We also had a Electric Typhoon and a Carbon Blade. Giant Zagi dry humps Geoff. I am lying down for scale purposes. Did well in the wind! Dumpster looking very happy, normally his maidens are very dramatic and end in disaster. His Electric Typhoon did not buck the trend. To say we are a little weary of that prop is an understatement. 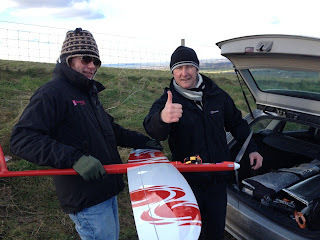 What with Daves dodgy programming not knowing how to turn the motor on or off, and his obsession with 'firmware' upgrades to his transmitter, which rendered it alien to him, it was amazing it actually flew! But it did with the usual cussing and swearing from him and went like the clappers. Martin reckons we wont see it again.. think i agree! I had over 10gb of footage and had to whittle down to 4 mins, so apologise if you ended on the cutting room floor.. but that's life. Kick the wife, kids, dogs and cats out.. turn up to 11 volume!